What Color Dress Pants Should You Own? 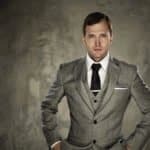 The best dress pants for you should not only compliment the entire outfit that you plan on wearing but should also have the proper cut, function, and weight as well. Finding a dress pant that works best for you is a little more than buying one that is at the exact measurements of your normal pair of jeans, khakis or chinos. The reality is that bodies come in many different shapes and sizes. To further complicate it, details like cuffs, pleats, and suspender buttons are an additional set of components that you need to think about when purchasing dress pants. 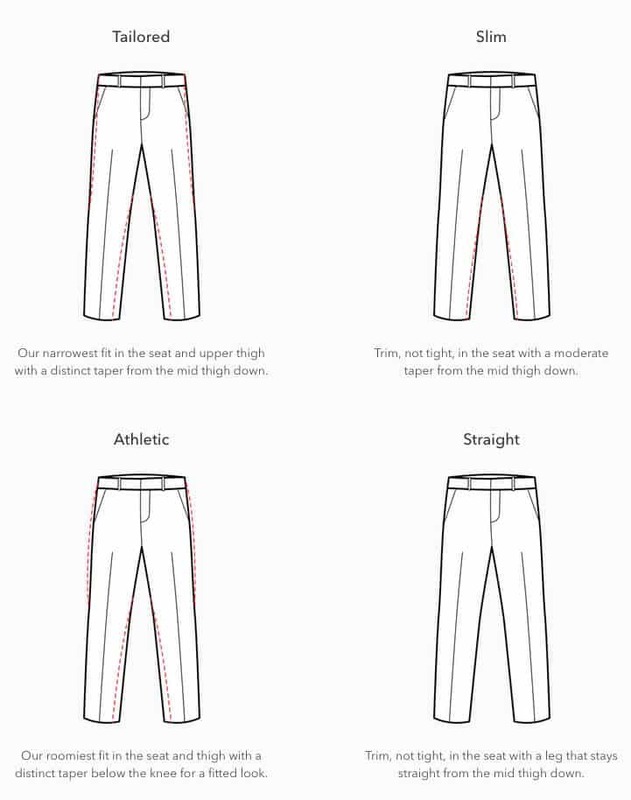 So, whether you are 5’ 4” or 6’ 2”, younger or older, our guide will serve just about any man out in selecting the best pants for both your body and style. It doesn’t take a tailor to understand the difference between jeans and dress pants – they are pants that are used for drastically different occasions. However, when you consider khakis or chinos, the lines will ever so slightly begin to blur. 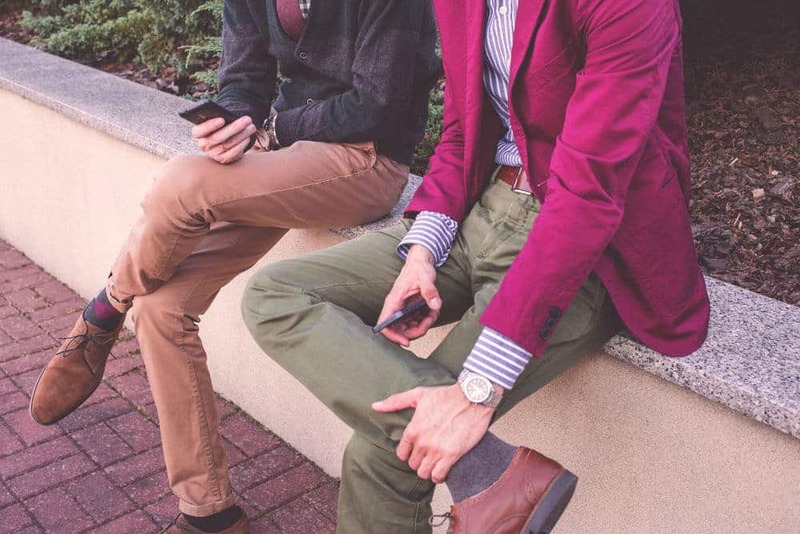 Both a color and a pant type, khakis are a bit more casual than both chinos and dress pants. Typically always featuring a cuff and or pleats (although not always as we recently covered in our chino vs khaki comparison), khakis are an everyday workplace attire. More often designed for men who skew a bit larger, the addition of pleats not only adds an additional design aesthetic, but will allow for a great range of motion, especially if you carry a bit larger of legs. Khakis will always nearly be tan in color due to both the origin of the name and the history of the garment themselves. Khakis also are normally paired with either polo shirts, casual button downs (without a tie), or sweaters. One of the biggest suppliers of khakis will be Dockers. A step up from the khaki pant will be chinos. Nearly always featuring a flat front, chinos carry many of the same aesthetics as dress pants, but are going to be both a bit heavier in fabric selection (to account for daily wear), along with having much a much bolder color selection. While the flat front is a staple of the chino, you will also find that they are also absent of cuffs – giving you the option by rolling them yourself if you so choose. Quite possibly one of the most versatile trousers that a man can own, chinos can easily be dress both up and down by being able to get paired with a variety of tops and shoes (something that no other pant option can quite match). The most formal of the three, and the focus of today’s article, will be the dress pant. Coming in a variety of fabrics including cotton, polyester, and wool to name a few (we cover this further in just a minute), dress pants are both for formal and workplace settings. Dress pants should be paired with button downs and sport jackets or blazers. However, we do see more companies like Ted Baker and Burberry showcasing their dress pants with causal shoes and T shirts. Depending on the make of the dress pants, they can be held up by either a belt or suspenders. The goal of dress pants is to be complimentary to the rest of your ensemble and not draw attention. Therefore, you will see most dress pants come in muted colors. Lastly, unlike khakis or chinos that can be machine washed, dress pants in most instances will be dry clean only (although there are sometimes exceptions to this as demonstrated in some of the dress pants we reviewed below). In order to find the right pair of dress pants for you, there are surprisingly a variety of factors that you will want to consider before you make a purchase. Finding the right one for your body type is difficult. Especially when you factor in seasonal fluctuations of your body weight. So, if you are purchasing a pair for the very first time and are unsure of what may work for you, we would recommend going to a store. We aren’t talking about your local big box retailer, but rather one that has a stylist on-site that can guide you in the right direction – think J. Crew, Scotch & Soda, Bonobos, Peter Manning (great for shorter men), or even Club Monaco. There you can try on a variety of dress pants with different cuts to get an idea of what works for you. 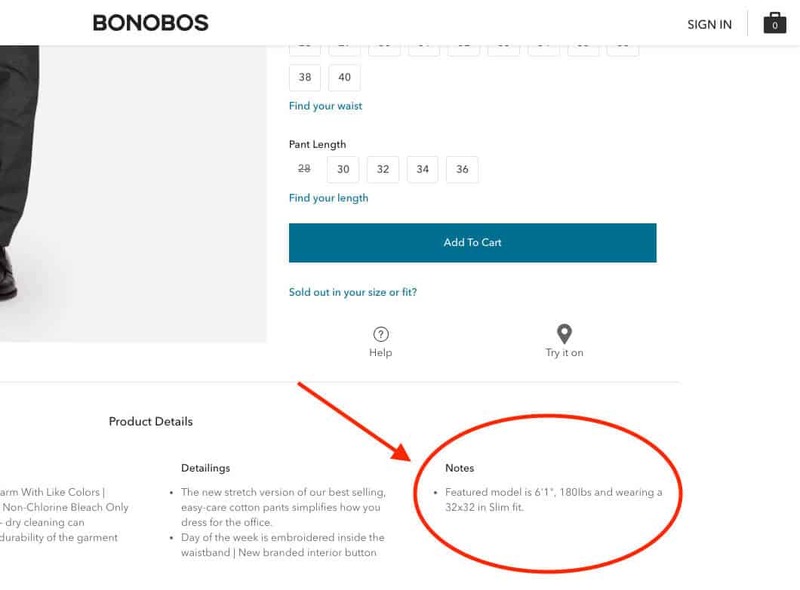 But if you just aren’t by a large city or simply don’t feel like dealing with any sales pressure, online retailers like Bonobos are pretty clear on how their cuts differ. 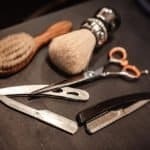 There you can easily see that the Athletic cut will be best suited for men who skew a bit larger while the Tailored cut is for medium sized men looking for a more contemporary look. When compared to some of the other pants in your wardrobe (namely jeans and chinos), dress pants will sit just a little bit higher on the hip. Furthermore, the length of dress pants will also be slightly shorter as well. 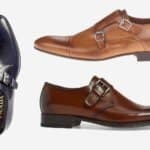 Unlike jeans that will rest comfortably on the top of your shoe, dress pants cuffed or straight, should extend to the back center of your dress shoe. In just about all cases, no dress pant that you purchase online or at a local retailer will fit perfectly. So, expect to bring your pants to your neighborhood tailor to have them hemmed. However, just know that this look is a bit more trendy and won’t be as timeless as having the pant extend to the length of your shoe. Largely a personal choice, cuffed bottoms do provide some utility to the dress pants themselves. Adding a slight bit of weight to the bottom will make it easier for the dress pants to remain straight throughout the day. While cuffed pants may provide utility, un-cuffed pants will provide not only a cleaner and more streamlined look, but will also be a bit more contemporary as well. If you are one to follow the norm, most dress pants on the market will not have cuffs. Nearly all dress pants will feature belt loops as a way to ensure that your pants remain fastened while worn. However, when looking at more the super luxury brands or even Italian sourced pants, you will come across dress pants that don’t have belt loops. In these instances, you will want to make sure that you have a pair of suspenders on hand to wear with the pants. While a properly fitted dress pant should never slide off your hip, the additional assurance of suspenders will be favored by men. Just be sure that if you plan on wearing suspenders, make sure that you wear a sport jacket or blazer in order to not call too much attention to yourself. And of course, depending on the type of suspenders that you own, you will want to make sure the pants do have buttons inside the waistband. Coming in either single or double varieties (with the latter being much rarer), pleats are great for men looking for a bit more fabric to allow for a greater range of motion in their pants. Like cuffs, pleats are largely a utility choice rather than one of style. If you are looking for a more contemporary and sophisticated look, you will want skip on pleats when picking up a pair of dress pants. It bears repeating that dress pants aren’t jeans, khakis, or chinos. They should be a bit more form fitting than all the pant options mentioned. But be sure to look out for problem areas when trying on a pair of dress pants. They shouldn’t bunch up around the crotch or thighs and should still provide you with effortless range of movement when both walking and sitting. 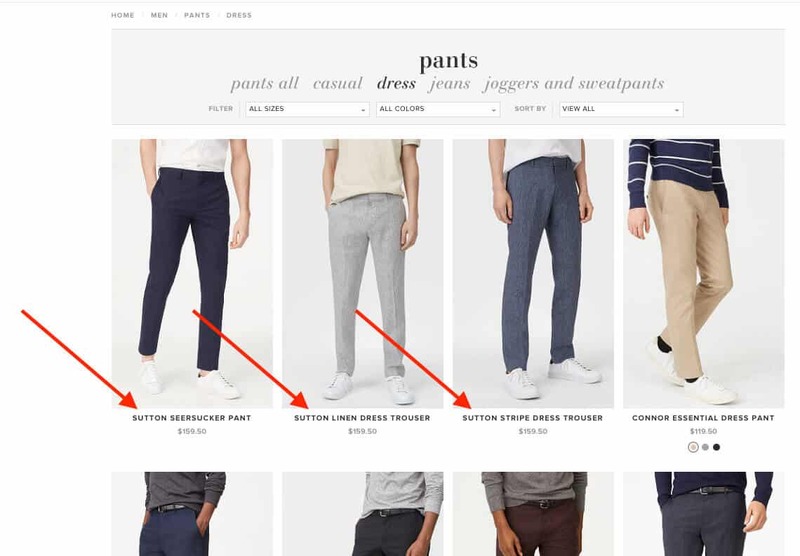 There’s a reason why companies like Amazon are investing so heavily in clothing (source – pay wall) – purchasing a pair of dress pants online is really difficult. Especially given the fact that its estimated that around 40% of online clothing purchases get returned (source). With that being said, here are a few retailers we wanted to direct you towards that not only have favorable return policies, but may actually make dress pant shopping a bit easier. While now fully owned by Walmart, Bonobos has set the trend when it comes to men’s fashion. Their fully online presence coupled with their 50+ Guideshop locations across the U.S. where you can try on their clothes (but still must order them online if you decide to make a purchase), provides a terrific lineup of moderately priced ($98 – $198) men’s dress pants available in 4 different fits (tailored, slim, straight, and athletic). 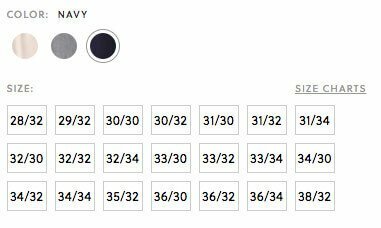 But what we really loved about Bonobos, was their descriptive product pages. While we would love these pictures to be provided in a variety of body shapes, this is at least a starting point that we hope they further expand upon. You have 45 days to return your unwashed and unused dress pants free of charge. If its outside the 45-day window but still within 90 days from the date of purchase you can get store credit to use on a new pair of dress pants. 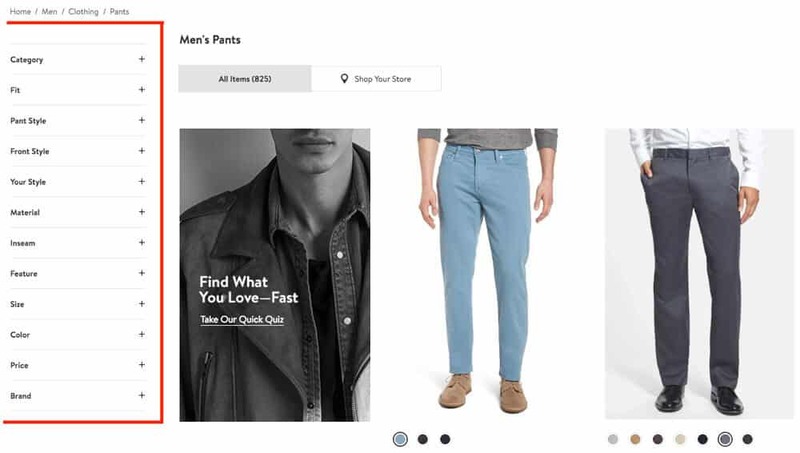 Overall, this makes Bonobos a great online retailer to try out a plethora of dress pants and only keep the ones you want without having to deal with the headache of shipping charges. Making daily deliveries around NYC to the super rich, London based Mr. Porter (part of the YOOX Net-A-Porter Group) is one of the most luxurious retailers not only featured on our list, but of all men’s fashion around the world. 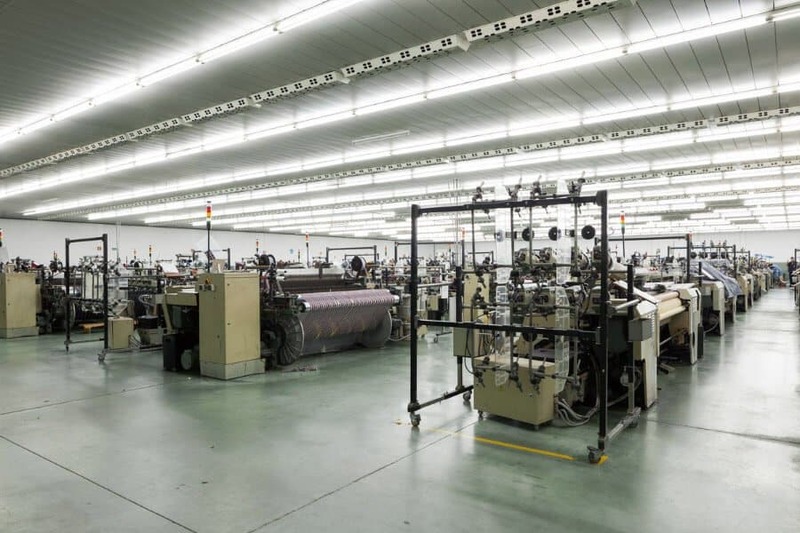 While still carrying staple brands like Hugo Boss, Prada, and Calvin Klein, Mr. Porter regularly stocks Ermenegildo Zegna, Alexander McQueen, Lanvin, along with several others. 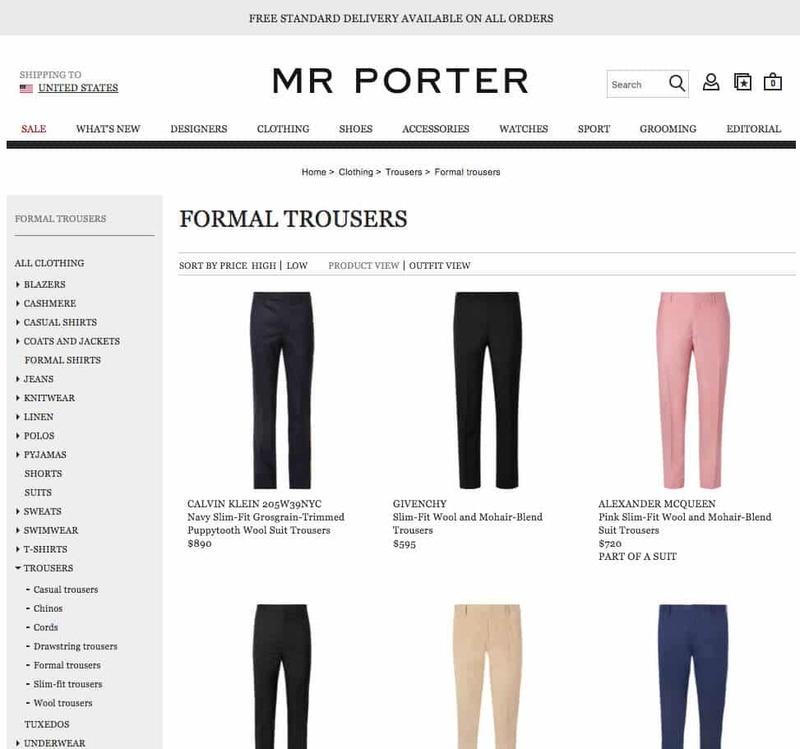 If you are looking for uncompromising quality in a dress pant and don’t bat an eye at spending between $300 to $1,000, then Mr. Porter will be your preferred retailer of choice. Chances are that if you are spending that much on dress pants, shipping and return costs will be quite frivolous. Seriously, if you need to pick up a pair of dress pants and a box of Play-doh for the kids, you can do it all in a couple of clicks. 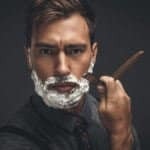 Men who are signed up for Amazon Prime of course will get the free shipping along with a plethora of other benefits as well (Prime Video anyone?!). But not to get too off topic, the dress pants offered up through Amazon is of course vast (for better or worse). To further emphasize the product selection, a quick search of ‘dress pants for men’ came back with 10,000 results!! Amazon is one of the best options out there when it comes to returns (especially for clothing). Their new offering of Prime Wardrobe makes it effortless to try on clothes and send back the ones you don’t want. This process is pretty simple and it will only take a few clicks. 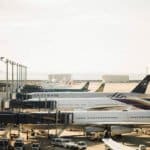 Of course given the size of Amazon, they have a pretty cozy relationship with most carriers so you should typically have options to return either through USPS or UPS and can even have them come pick it up from you rather than having to make a trip to the nearby store to drop off the ill-fitting pants. For a lot of men, Nordstrom typically isn’t at the top of mind when it comes to regular clothes shopping. 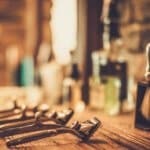 However, with their recent push towards marketing towards men (source) along with being the highest rated in service, ease of shopping, and ambiance according to a recent industry-wide retail survey (source) makes them one to take notice of if you are looking to upgrade a few clothes in your wardrobe. 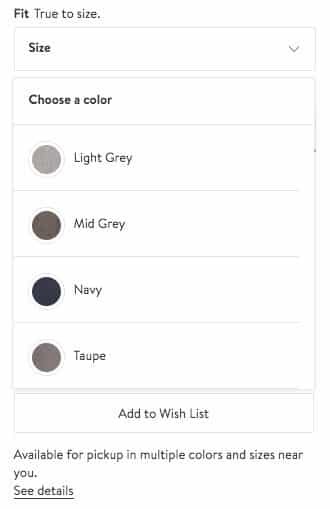 With this filtering you can not only select pants with pleats or with a flat front, but you also can select color, materials (great for seasonal shopping), price, brands, and more. It’s pretty evident that Nordstrom is working pretty hard to gain their trust among men. 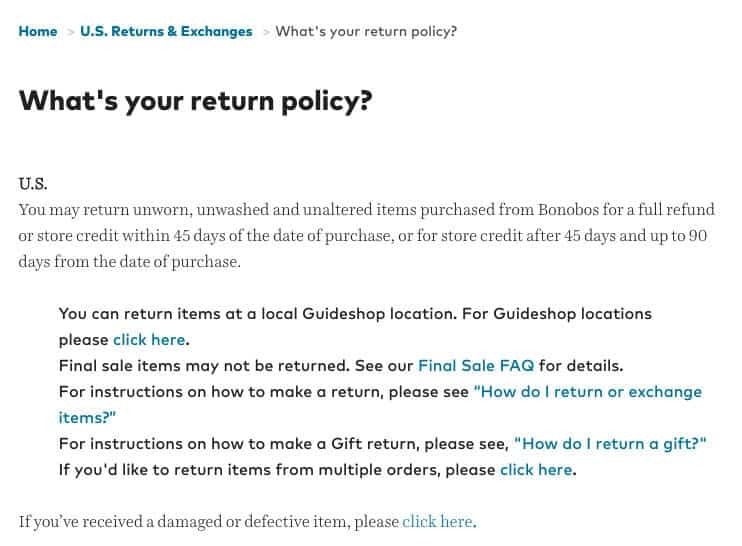 Unlike all other online retailers we covered, Nordstrom’s return policy is a bit more ambiguous. Handled on a case-by-case basis (likely to prevent abuse), their goal is to make you happy. While we haven’t come across any grossly negative stories about the process, we thought it was at least worth mentioning (remember, they were ranked as the best retailer in service). Although, as far as price for sending the return (and the shipping), it is free – making it just as good as any other retailer we covered on our list. Depending on where you live and the climate that you largely plan on wearing your next pair of dress pants will dictate the fabric that you buy. 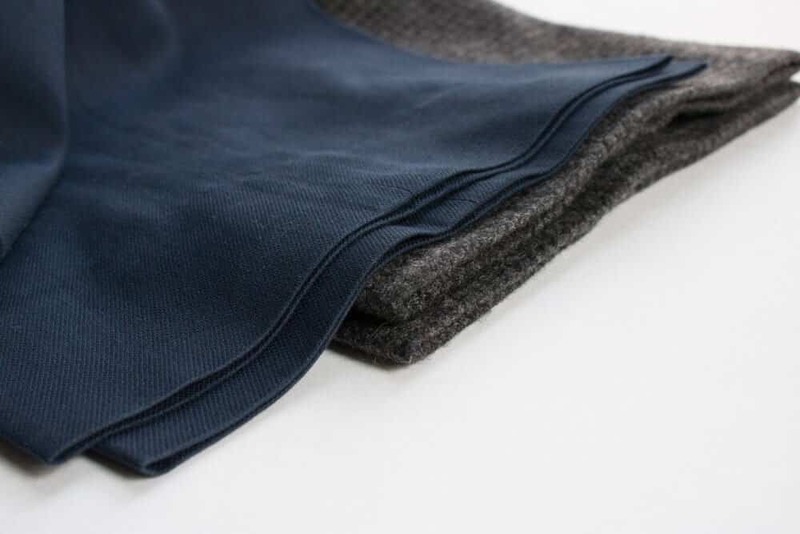 Wool will be much thicker and will retain warmth – a key feature given that dress pants are much thinner than their more casual counterparts (note: there are some dress pants that feature finely wound wool that can be worn in warmer months so be sure to read the descriptions of the pants before making your purchase). For those living in warmer climates, plant based fibers like cotton or linen will give you much greater breathability. This will help to ensure that the fabric doesn’t stick to your skin or make you sweat when even just casually walking. 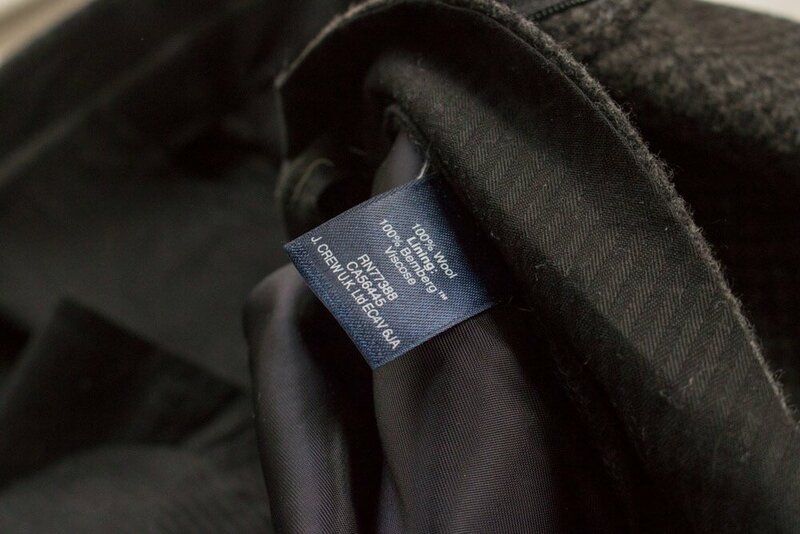 When sourcing a pair of dress pants, make sure that you take a look at the inside of the tag (or read the description online) when you are deciding on your purchase. Lastly, you will sometimes see elastane or Spandex also included in the fabric composition (usually less than 5% of the total) – this is a good thing. The addition of this stretchable fiber allows for greater movement when both walking and sitting. If you find yourself going from meeting to meeting or quite active when wearing dress pants – look for this fiber included in your next pair of pants, you will be happy you did. When buying a pair of dress pants, the most important aspect is going to be the fit. A bad fit with excellent fabric is still a bad fit. However, a good fit with poor quality fabric may not only degrade quickly with time (especially if you plan on wearing them regularly) but may also cause discomfort while wearing. Based on our experience, we find that dress pants greater than $75 will be sufficient in quality. For quality we are referring to the strength of the threads and their susceptibility to breakage (i.e. so you don’t bend over and have a split seam), ability to retain their structure after several cleanings, and of course the quality of the fabric itself. First, don’t expect a pair of black or navy pants to perfectly match the same color of your suit jacket – it won’t. All too often men might try to replace a pair of pants that may have ripped or have grown out of (weight, muscle, or height changes) and find that the suit jacket still fits, but the reality is that no two dyes are the same. 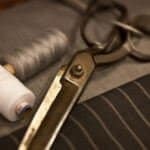 To further emphasize this, if you try and buy replacement dress pants for a suit (even if the same exact pants as previous), fabric wears in its own unique way. Purchasing replacement pants would make for a slightly vibrant or darker bottom half and a lighter (or more subdued) top half of your suit and be distracting to the eyes of others. So, when buying dress pants, take a quick minute to walk over to your closet and look at the clothes that you own and ask yourself what pants you are thinking about buying and how they will work into your wardrobe. Now if you are a man that is wearing dress pants on a regular basis, you may want to get a few different colors to mix up your wardrobe. But remember – dress pants aren’t chinos. So even if a retailer offers a dress pant in several bold colors – select a more muted option (think charcoal, dark tan, navy, etc.). However, if its summer time, feel free to get a little bit aggressive and go with perhaps the Bonobo’s Weekday Warrior True Khaki or even this pair of trousers by Topman. To ensure that your new dress pants last as long as possible, it’s important to care for them properly. This means reading the labels and understanding the symbols. While ironing and starching your new dress pants at home is fine, if you have a big interview or formal event coming up, we would recommend bringing your pants to your local dry cleaner to have them pressed. Ringing up at only a couple of bucks and can be done same-day, freshly pressed clothes will, in most instances, look much better than if you were trying to do it yourself. There is a lot to like in this dress pant offering by Bonobos. 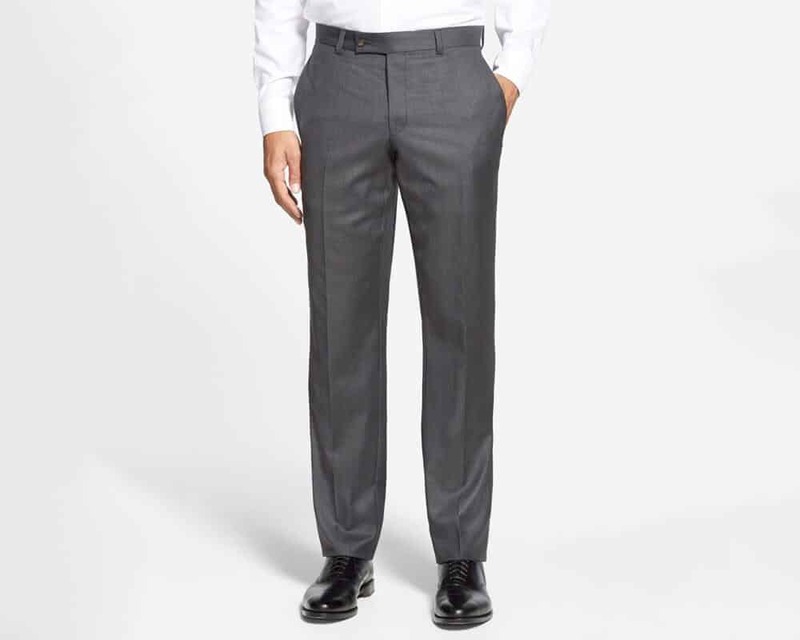 Composed of 95% cotton and 5% elastane, these dress pants will not only give you the breathability you will be looking for, but the small inclusion of elastane give you a fair bit more stretch than a traditional 100% cotton dress pant making both walking and sitting a bit more comfortable. For the men looking to know more about the fabrics and where it was sourced, these Italian Trousers do feature cotton that was milled in Italy (Manteco Mill). You can check out their full website here. Fabric sourcing aside, when it comes to fit and function of these pants, the amount of options available to you are second to none. While these pants do feature a washable fabric, it is recommended that you do dry clean them in order to ensure the overall structure of the pant and to prevent shrinking. While these pants do have a commanding price tag (~$200), for those men looking for a close alternative at a fraction of the price, we would recommend checking out the Stretch Weekday Warrior Dress Pants. Overall, for the price, the Stretch Italian Trousers still are an uncompromising dress pant that will be sure to serve you for years to come. Key Takeaway: The Stretch Italian Trousers are perfect for mid to high level execs that plan on wearing dress pants daily. While the dry clean only aspect can be a deal breaker for some (if that’s the case, consider the Weekday Warriors), the blend fabric will move easily with your body – especially if you find yourself going to countless meetings. What We Liked Most: It’s a versatile line up of pants where you can pick or choose what works best for your style. Bonobos also delivers decent quality across all their lines. What We Didn’t Like: Not much to have a gripe about here. 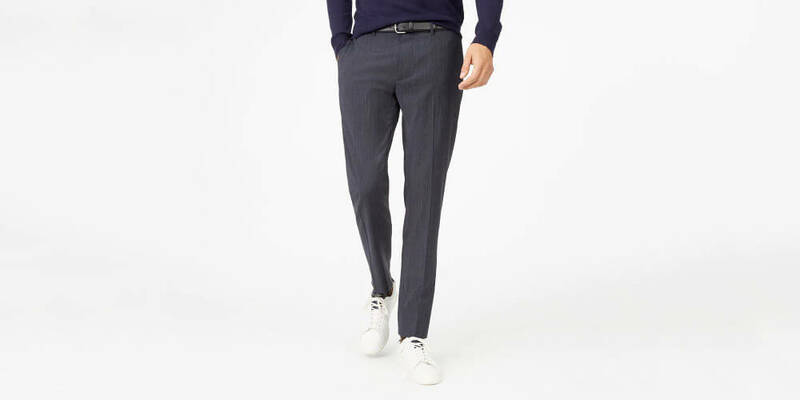 More sophisticated than a chino yet able to be dressed up to a button down and dress shoes or down to sneakers and a T, the Sutton Stripe Trouser is perfect for men who wish to not only blur the line when it comes to dress pants, but want something a bit more versatile in their wardrobe. Perfect for men who need a dress pant for the occasional formal outing but not feel like its collecting dust in their wardrobe between such events, the Sutton Stripe Trouser is a wool based dress pant (dry clean only) that can be worn in all seasons due to its finely wound wool. A bit restricted when it comes to fit, the Sutton Stripe Trouser only comes in slim. Key Takeaway: The Sutton Line of pants will look great on men with slightly thinner frames. The slim fit cut of these trousers have a nice taper that will bring the viewers eye up to your face. With a variety of fabrics available across the Sutton line you can select a seasonal or seasonless offering. What We Liked Most: For the quality of the fabric in the trouser provided by this luxury brand is quite a steal (price is typically around $150). What We Didn’t Like: We wish there were a bit more variety of cut and waist size. Depending on the build of your legs will determine the line of J. Crew pants that you decide to go with. Ludlow is designed for the slimmer men by having narrower legs (slim fit) while the Crosby will have additional space in both the seat and the legs (tailored fit). But regardless of your build, when browsing their selection of dress pants you can sometimes find the same fabric or style between both lines. One dress pant that caught our attention and worth discussing a bit further was the wildly popular Ludlow Unstructured Suit Pant. These pants provide an incredible quality fabric at an affordable price ($98). While not paying the markup placed on a comparable Burberry trouser that can cost upwards of $325, the Ludlow Unstructured suit pants are a steal. Like the Bonobo dress pants we also covered, the Ludlow Unstructured Suit Pant does have a slight composition of Spandex within the fabric which allows for a greater (and more comfortable) range of movement when both walking and sitting. Lastly, the fabric is dry clean only (to retain both size and shape) and does tend to fit true to size. 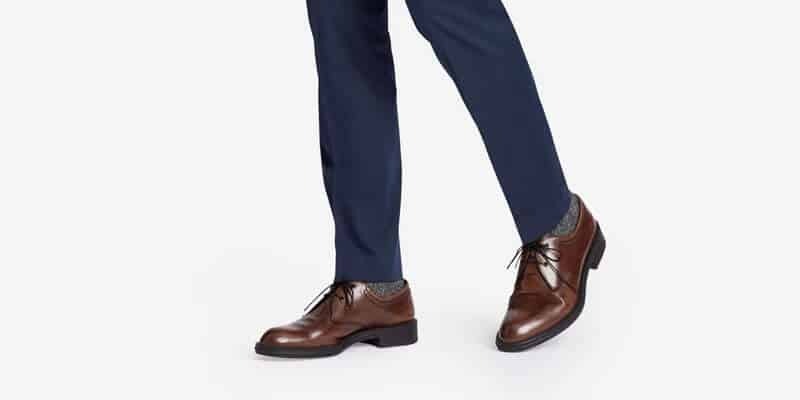 Overall, if you are looking for a dress pant from an industry staple while still being comfortable in a slim fit dress pant, then these Ludlow’s are worth checking out. Key Takeaway: Sourced from the same mill that makes clothes for super luxury brands. Hybrid fabric allows for greater movement than a 100% blend. Affordable price tag for a quality pant. What We Liked Most: Great value buy for those who don’t mind spending a little more for a quality cut and fabric. What We Didn’t Like: Wish the unstructured line by J. Crew was carried over to the Crosby line. Now normally some men may scoff at the idea of purchasing a private label brand of dress pants – and that’s typically a fair reaction. We all know how a bad pair of dress pants will not only wear poorly, but will often rely on an inferior fabric that will degrade quickly over time. But the Nordstrom Cotton Trousers will completely change this notion that private label equates to a compromised product. Sourced from Supima Cotton (same type of cotton found in Brooks Brothers dress shirts – which normally retail for about $100 for a single button down and countless other brands) is an extra-long staple American grown cotton. A long staple cotton not only will ensure a much stronger fabric, but will wear incredibly well with time. It’s durability is amazing, yet still features many of the great qualities of cotton – namely breathability. For the men who don’t want to deal with extra trips to the dry cleaners and want to simply wash their pants at home, the easy care for these pants will be welcomed. Beyond fiber selection, these pants do come in 5 different colors and waist sizes up to 46” – serving just about any shape or size of the men reading this. If there was one limiting factor of these dress pants it would be the cut. Designed for larger men, the straight cut leg will provide ample space in the seat, crotch, and leg area of the pants. For those men that want both pleats and cuffs, check out the similarly price Pleated Trousers – both offer identical color selection as well. Key Takeaway: This is a great affordable dress pant for average to larger size men. The straight cut leg will give you plenty of space. The quality fabric is extremely easy to maintain. 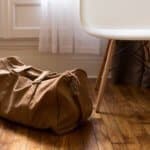 What We Liked Most: Who doesn’t like to save an extra 20 minutes every week by skipping the dry cleaner? 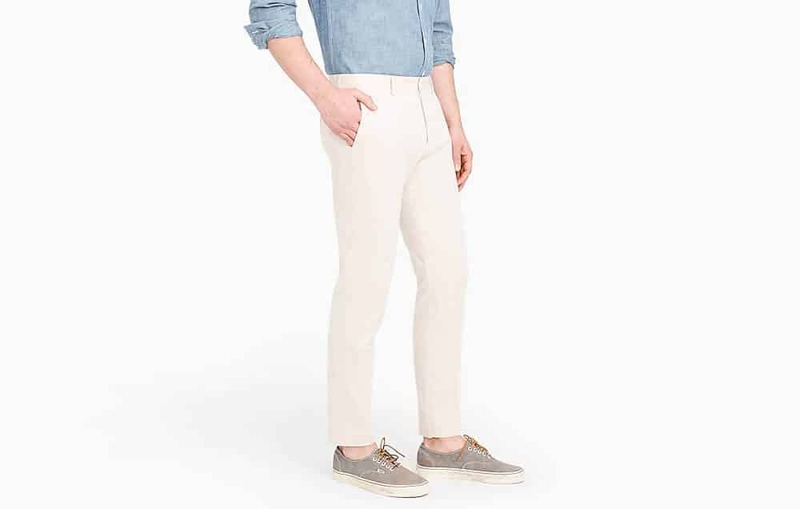 What We Didn’t Like: Wish Nordstrom offered this pant in a few different cuts for slimmer men. If you are looking for a sophisticated style from a contemporary brand that doesn’t go overboard, then Ted Baker will be your best bet. 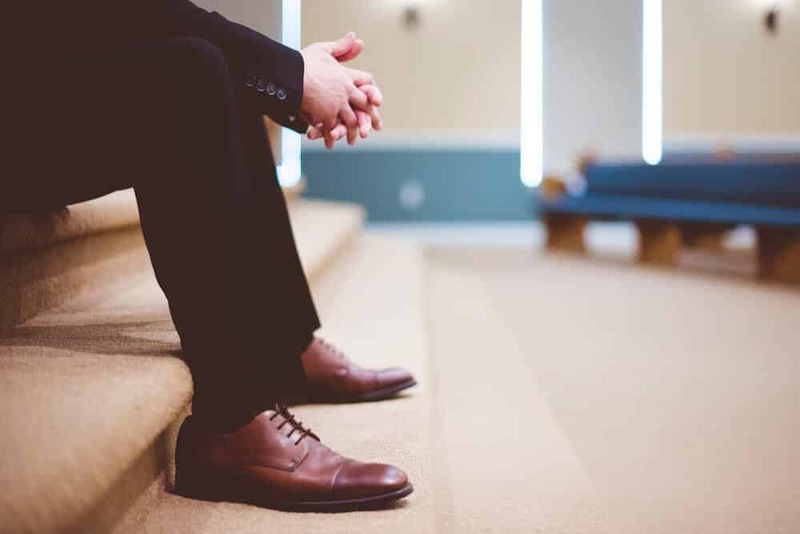 While their dress pants can normally be found in the pages of Men’s Fashion magazines paired with sneakers and T shirts, they are equally (dare we say more) acceptable in the echelons of upper management (and those making their way there). These Jefferson Flat Front Wool Trousers by Ted Baker have a lot going for them. With a 100% fine wool design, they will not only feel incredibly comfortable year-round, but will retain their look with absolute ease. Sure, the dry clean only care instructions may be a stickler for some, but if you want to look great day after day, then it doesn’t really get much better than this. While the 100% wool fabric found in the Jefferson’s might limit movement just a bit (given that there is no elastane or Spandex found in the composition), if you are looking for just that little bit extra stretch but still want to stay within the Ted Baker brand, then the Jerome’s will be your dress pant of choice (99% cotton, 1% elastane). But back to the Jefferson’s – the low rise cut of the waist will be akin to jeans while still looking great when you are without a blazer or sports jacket. Secondly, the tapered leg design, while limits it to average to slimmer men, will work great for men with waists upwards to 40”. Lastly, and perhaps the best part of the purchase with these pants, is the FREE hem service that is included. Key Takeaway: Versatile dress pant that can be dressed up or down. Sophisticated tapered leg cut that will look great on a lot of men. What We Liked Most: Great color and size selection. Free hemming service with purchase is terrific. What We Didn’t Like: Wish it were just a little bit cheaper. Another private label, but this time from a much more familiar retailer, is Goodthreads by Amazon. 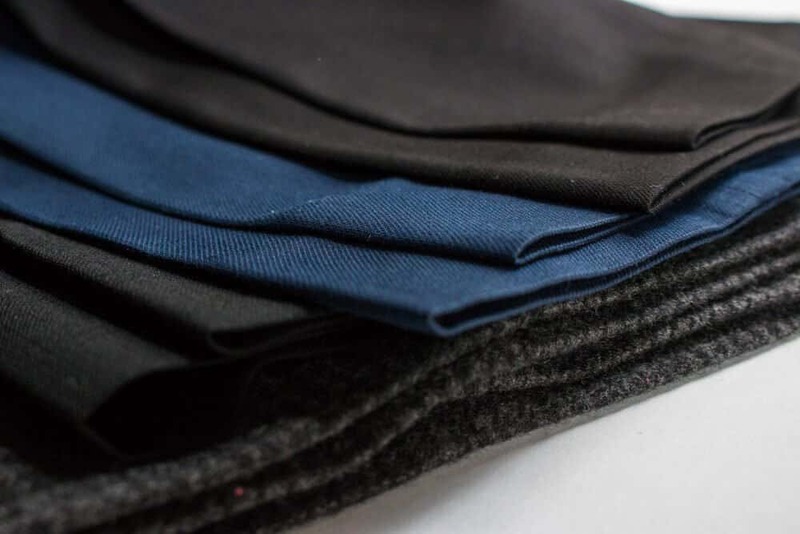 Exhibiting many of the key characteristics of some of the nicer dress pants on our list, namely the hybrid fabric qualities (98% cotton, 2% Spandex), Goodthreads is starting to make its way into men’s hands everywhere. While the fabric of these pants alone is enough to have many men stop and take notice, another nice feature of them is that they are both wrinkle-free and machine washable. These dress pants, much like those from Bonobos, comes in a myriad of both color choices and sizes. Very similar (although not the same) as J. Crew’s Ludlow and Crosby line, these two cut choices will be perfect for just about any man’s body sizes. 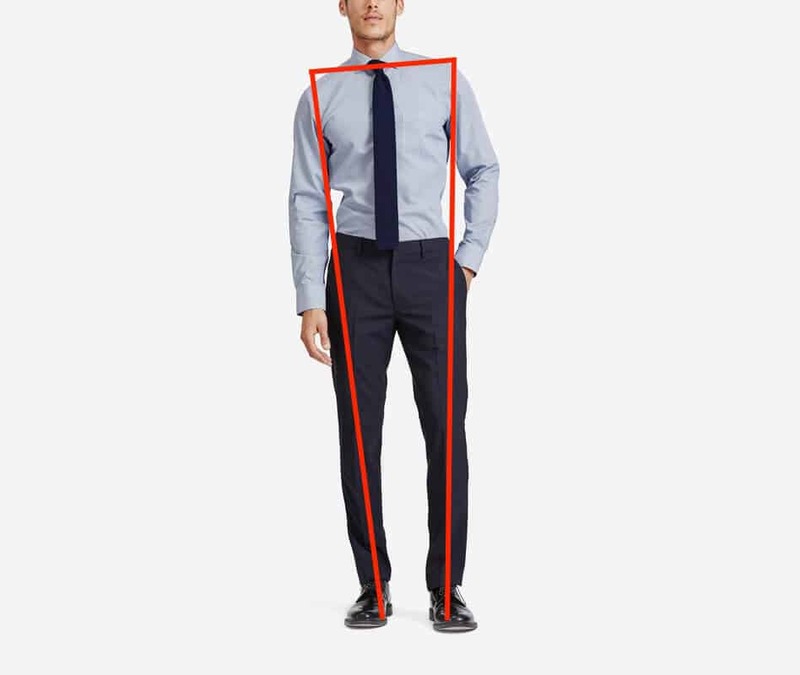 With waist offerings between 28” – 42” and length between 28” – 38” nearly all men reading this should be able to find a pair of dress pants that works for them. Key Takeaway: Great workhorse dress pant that carries many of the key qualities of the more luxurious brands on our list at a fraction of the price. What We Liked Most: Size, color, and cut selection serves up a wide range of options. Machine washable. What We Didn’t Like: May not be suitable for super formal occasions. Built for comfort and low maintenance are the first few words that come to mind when considering Haggar’s. 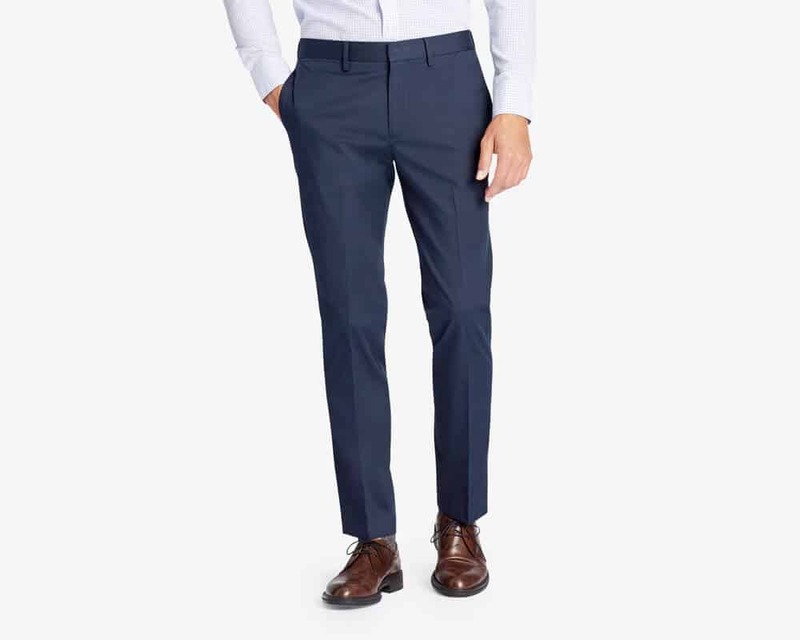 There is a reason that this dress pant is one of the most popular on Amazon with over 6,000 reviews at the time of publication – men just simply love the versatility and price of these pants. Evoking many utilitarian qualities like the expandable waistband and moisture wicking properties, you won’t have to worry about replacing these pants if you fluctuate a few pounds. 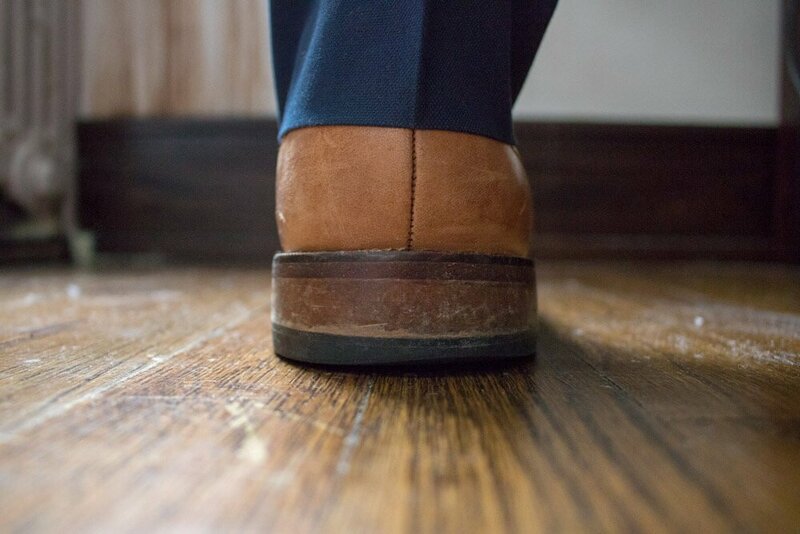 While the Haggar’s pictured above feature a flat front, they do offer a similar line with pleats. Secondly, if you frequent the Big & Tall section, you will want to check out their Cool 18’s offered there as well. Given that these are normally marked with a sub $50 price tag, there will inevitably be some compromises when it comes to quality. Most noticeably will be the fabric. 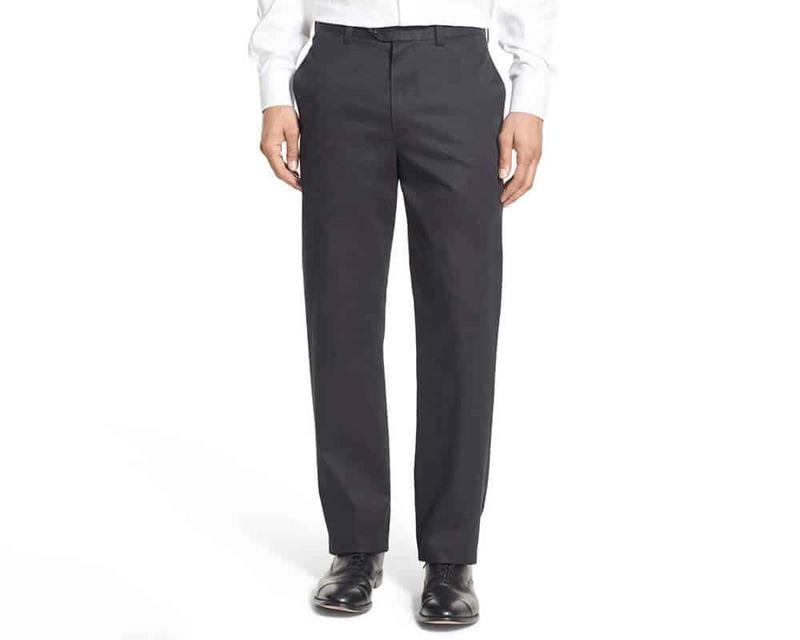 While some men simply prefer natural fibers like cotton or wool, these dress pants by Haggar do depend on Polyester. 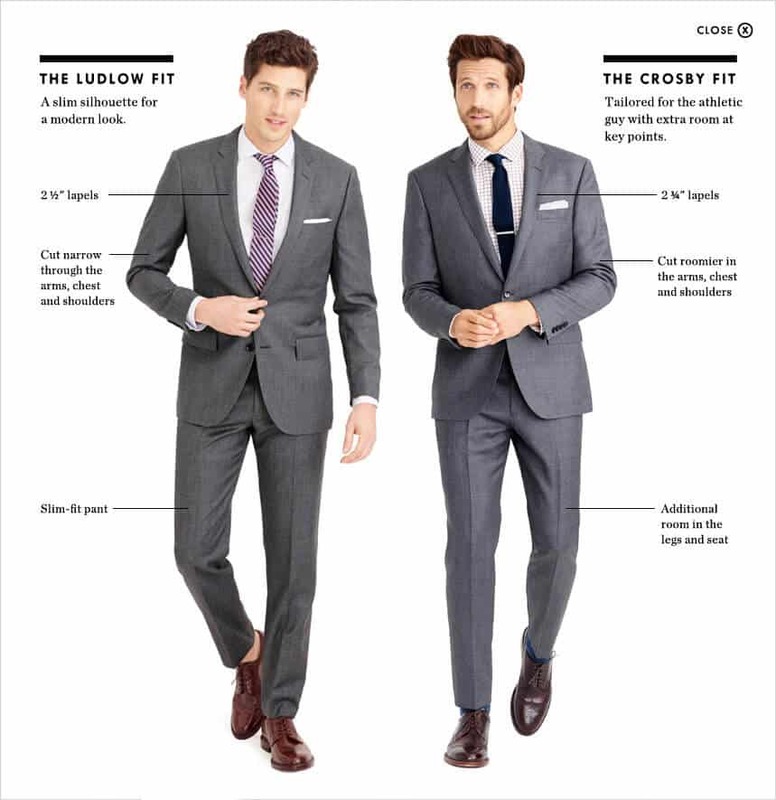 Key Takeaway: Great dress pant for men who are on a budget but need to present well. Widest variety of body sizes from small framed men to those who skew either big or tall. What We Liked Most: Machine washable and expandable waistband. What We Didn’t Like: Lack of slim fit offering. For bold style and super luxury dress pants, Prada will be among the top brands that come to many of men’s minds. 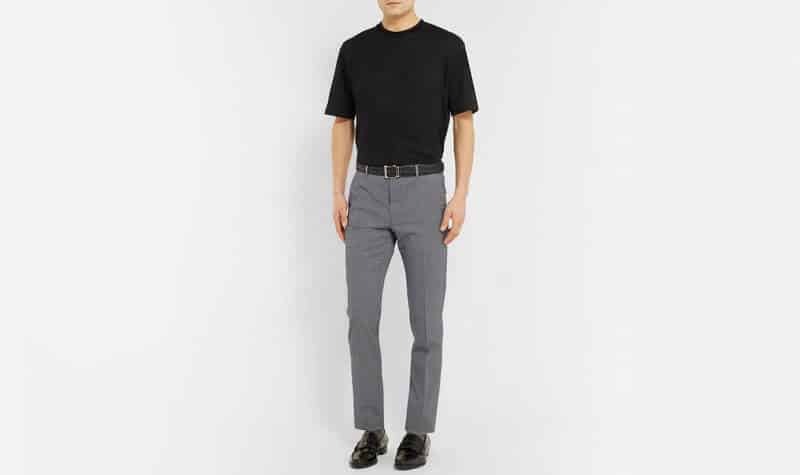 If you are looking to set the stage and make a statement with your dress pants, then you need to take a look at these exclusive Prada pants carried by Mr. Porter. Evoking a retro 50s feel to them, the gingham design, while bold, is an extremely versatile look that can go with both button downs and T shirts. Made from a stretch wool fabric, you will still achieve great range of movement. Should your budget allow and you want a new dress pant that you will find yourself coming back to time and time again, check out this offering by Prada. Key Takeaway: It’s a dress pant that makes a statement. Super luxury offering from Prada. What We Liked Most: Bold design. What We Didn’t Like: It’s expensive.